Snow Goose Hunting can be frustrating if you don’t have the right decoy placement. In this review, we’ll take a look at some of the best snow goose decoy strategies and explain what makes them so effective. Whether you’re hunting in a stiff north wind or thick fog, your snow goose spread should be set in a way to maximize your chances that snow geese will decoy to it. Learning to read your surroundings and anticipate how birds will react will make you an even more successful snow goose hunter. The best snow goose decoy strategies are the U shape in strong winds, the X shape for variable wind direction, and the Blob shape for close action in the fog. Below is a list of the top snow goose decoy strategies and spread layouts that we’ve found to actually work. We’ve found these snow goose spread diagrams to work well with Sillosocks, Fullbodies, White Rocks, and other types of snow goose decoys. 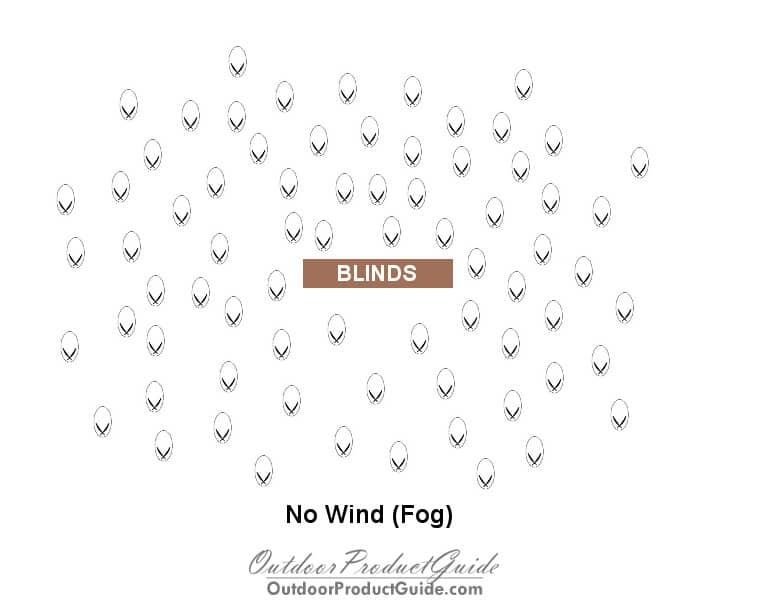 Factors such as wind direction, blind placement, and where the birds will be coming from should all be taken into consideration. The U-shaped snow goose spread is the most popular decoy layouts used across the U.S. each year and for good reason. The U shape helps funnel decoying snow geese directly into the middle of the spread and in front of the shooters. Blind placement can vary with a U shaped spread depending on the weather. 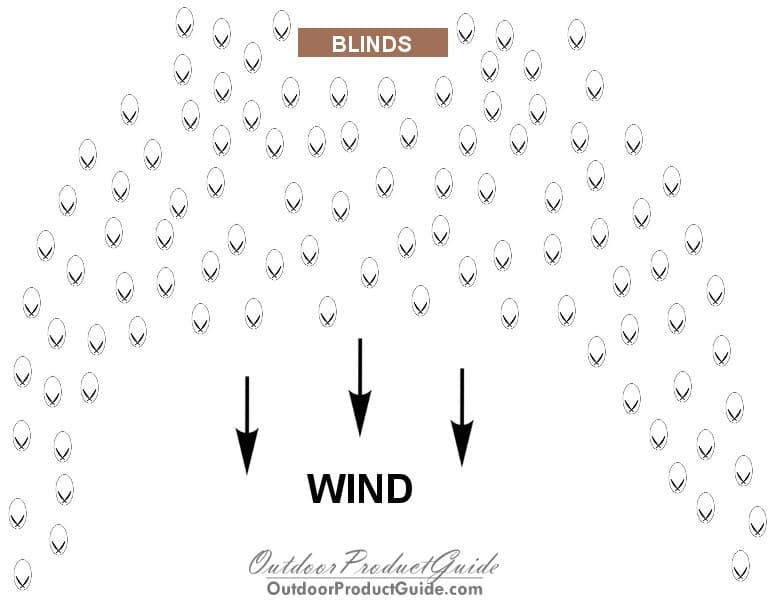 Blinds placed as far front as possible usually benefit the most in a strong wind since birds hover longer and often flare from the noise of windsocks flapping. Blinds can also be placed in the back of the spread giving birds more time to lower their height and not pass over too soon requiring hunters to spin around for the shot. Make the U-Shape at the front of spread first and then work you way into the wind. The back end of the spread can be strung out as far as you like. Further is better as it builds depth. 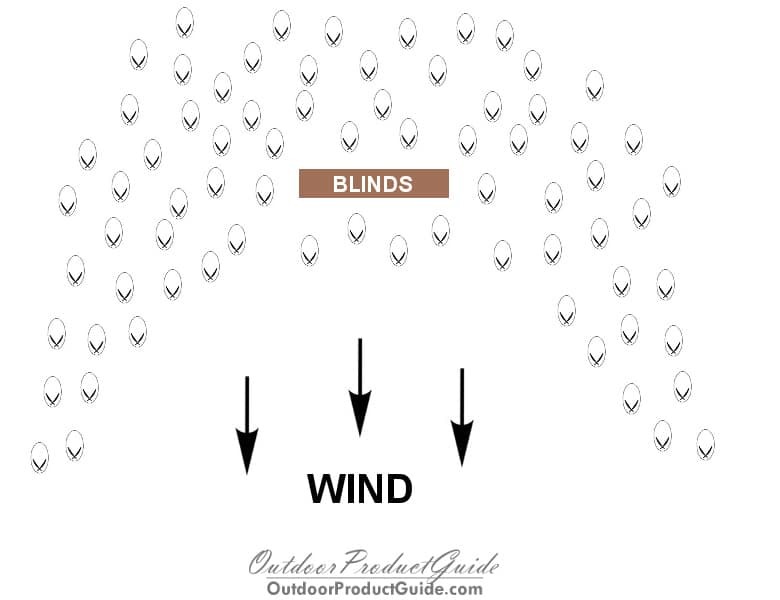 Adjust blind placement depending on wind strength. Putting the blinds up front works best in a strong wind as snow geese like to skirt off before they get directly over the decoys. In low wind conditions, placing the blinds further back gives the geese time to work the spread and provide a better shot. Hide blinds by packing decoys around them. Raised sillosocks on 36 inch stakes work great for hiding the silhouette of blinds. Use a random decoy placement strategy when setting out decoys. Rather than walk 2 ft, set a decoy, and then repeat, set 2 or 3 decoys close together and then walk 3 ft and set one while continuing to vary decoy amounts and distances. This will give your spread a more natural look and different than the standard spread they see. In high winds, place sillosocks and other windsocks stakes as far into the ground as possible to avoid the death wobble. Use levees and other small topographic changes to make you decoys more visible. Example: If a rice levee extends through your spread, pack the decoys tightly on the levee so they can be seen from far away over the rice stubble. The u-shaped spread with blinds in the back is useful on days with light winds up 10mph. This setup gives the birds a chance to work the spread as much as possible and lower their elevation as they work their way to the back of the decoys. It’s a great strategy to use on juvy snow geese, but hard to fool adult snow geese with since they have more time to check out the spread. Another popular snow goose decoying trick is to set your spread in the shape of an X. The X shaped spread is best used in situations with variable wind directions where constantly moving decoys around can be a tall task. The X shaped spread funnels birds into the center no matter which direction they come from. Blinds are placed in the middle and can be adjusted accordingly. This spread design works great if you know a front is going to be blowing through mid-morning and the wind direction is going to change completely. Fog can be one of the most frustrating snow goose decoying scenarios, especially hunting traffic birds. If birds aren’t vocal, they often show up without you knowing and you may never even see them. One of the best snow goose spread layouts for fog is the “blob” shaped spread. This type of spread is set tight and in the shape of a circle. This helps insure you can cover every inch of the spread equally. If birds show up unannounced in the fog, you will be able to have a shot at just about every approach angle. Set the spread as tight as possible. Be close to the roost because birds won’t fly far in fog. Hunt plowed fields or rye grass. Geese prefer plowed ground in the fog. Call frequently to attract quiet birds that may be milling around. Be vigilant. Snow geese can appear at any moment from any direction in a fog. For other snow goose hunting tips, check out my guide here. Here is a great clip of what the U Pattern is and how to set it up. How Many Snow Goose Decoys Do You Need? After hunting snow geese for many years, it’s clear that there’s a certain amount of decoys you should set on every snow goose hunt to maximize your chances of having a great day in the field. With 200 decoys being too few, and 1500 nearing the point of diminishing returns, how many snow goose decoys do you need? I recommend that every time you set a snow goose spread to set at least 500 decoys. More is almost always better, but 500 decoys should be your goal whether you’re hunting alone or in a group. 500 decoys is the perfect amount to help draw birds in from afar while providing enough decoys to hide in. Anything less is too few unless you’re right on the X, and anything more is not really a factor unless you’re hunting with a large group of hunters or trying to get the attention of migrators up high. 500 decoys is the sweet spot if you’ve done your homework and all the other factors that go into a having a successful snow goose hunt line up. The most cost effective way to set a good spread is to use Sillosock windsock decoys. Click here to check them out at Amazon. Snow geese can be harvested over small spreads consisting of fullbody decoys or stuffers in low pressure areas or on grit piles. Small spreads also work well during e-caller season and years where juvenile birds are abundant. The Greenhead Gear Pro-grade Snow Decoys are especially effective fullbody decoys for late season snows. Click here to check them out at Cabelas. Small spreads work best when they are placed in locations that snow geese are already coming to daily. This could be a hot feeding field, water source, or rye grass patch. The birds will already be comfortable with the spot, so you don’t need a lot of decoys to draw their attention. Small Snow Goose spreads don’t offer any relief for hiding, so they are best used with pit blinds or set near fence rows or other natural vegetation. Layout blinds can also be used if they are camouflaged extremely well. Small spreads really work well during conservation season in areas where unpressured birds are loafing around. Some of the best hunts can be had over less than a dozen snow goose decoys and good e-caller. The best snow goose spread layouts are those that use the wind and other factors to funnel the birds to the spot where you’ll get the best shot. We’ve combined some of the best snow goose decoy strategies into one review that have proven to be the most successful. The “U” shaped spread is designed to be used with moderate and high winds. 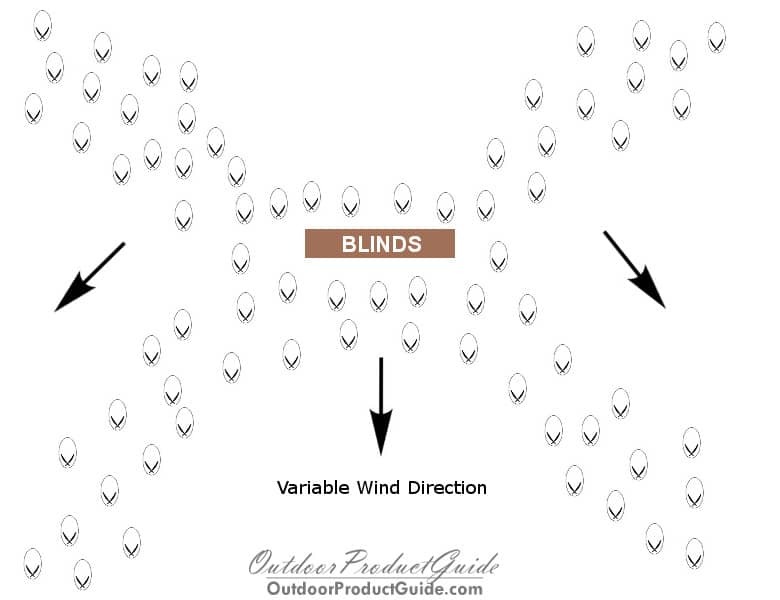 It works by funneling the birds into the blinds at the middle of the spread. The blind location can be adjusted front to back depending on how the birds are working. The X shaped spread works best in variable wind conditions. The wings of the X help to funnel birds into the blind in the center. As the wind changes, the spread will always have a funnel direction. The best snow goose spread for the fog is a tight and compact circle. This insures you can cover the entire spread from all angles and birds won’t be able to sneak up on you. The ideal number of the snow goose decoys is 500. Any less and you run the risk of not being able to grab the attention of traffic birds. If you’re hunting in a large group, 1000 or more decoys is ideal to help hide everyone. Small snow goose spreads can work but you have to be in a spot they use routinely. Fullbodies and stuffers provide the realism you need to get snow geese in close with just a few decoys.